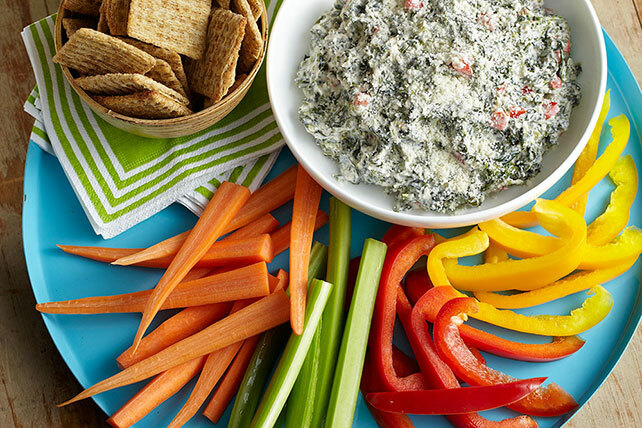 Creamy with sour cream and Caesar dressing, this cheesy spinach dip is sure to be a hit at your next party. Mix sour cream and dressing in medium bowl. Reserve 1 tsp. cheese. Add remaining cheese to sour cream mixture with spinach and peppers; mix well. Serve with crackers and cut-up fresh vegetables. This simple, yet flavorful, dip can be prepared ahead of time. Refrigerate up to 24 hours before serving. Prepare using BREAKSTONE'S Reduced Fat or KNUDSEN Light Sour Cream, KRAFT Lite Creamy Caesar Dressing and KRAFT Reduced Fat Parmesan Style Grated Topping.